The Episode starts with Preeto asking Soumya to keep Goddess’ idol with her and says this will give you strength. Soumya asks her to take care of Harman. Preeto says I will take care of my son, and asks her to go and bring her son. Soumya takes taxi to Chandigarh airport and then asks taxi driver to take her to Gurdaspur. Harak Singh reaches hospital and asks Preeto about Harman and Soumya. Preeto tells him about Harman and tells that Soumya went to Mumbai to bring Soham. Harak Singh asks why did you send her alone? Preeto says she is not weak and will bring her son. Doctor comes and says Harman is out of danger now. Soumya comes to Varun’s lawyer house and meets his wife. She tells his wife that her husband took her son along with Varun, to give for adoption. She says your son is saved with you, but I don’t know about my son who is with your husband. Soham starts crying. Varun asks him not to cry else he will remember only that, and says I doubt if you are my son or some inauspicious father’s son. Lawyer asks him to feed him milk. Soumya pleads infront of Lawyer’s wife to help her and tells that she just wants to know where her husband took her son in Mumbai. She begs infront of her. Varun says once you reach your new father, I will be happy. Lawyer’s wife calls him and asks where is he? He tells that he is in Mumbai with a client. His wife asks where is he? He tells that he is in a juhu hotel. His wife says I will plan big and come and ends the call. She informs the same to Soumya. Soumya thanks her. She comes home and packs her bag. Raavi comes and gives her money and important identity documents. She says we all are hopeful that you will bring our Soham back. Soumya hugs her and leaves from there. Raavi prays to God to protect Soumya. In the hospital, Harman gains consciousness and asks about Soham. Preeto tells that Mumbai Police caught Varun, and Soumya went to take back Soham. Harman says I will also go there. He gets up, but feels pain. Harak Singh asks him to rest. Inspector says he will take him to police station. Harman says I am ready to come with you for 20 years. Harak Singh tells Preeto that they should have gone with them. Soumya takes taxi to come to hotel. Meanwhile Lawyer sells the baby to Mr. Bhalla and says legally this baby is of Bhalla. Varun acts and tells Bhalla’s representative to handle him with care. They sign the papers. Bhalla’s representative says ok. Varun and Lawyer leave from the hotel. Representative also leaves from the hotel. Soumya reaches hotel and gives money to the driver. She walks inside and doesn’t see representative man taking Soham in the car. She comes inside and asks the receptionist showing Varun and the baby. Receptionist tells that he just left. Room Service guy comes and gives the keys to the receptionist. Soumya thinks where did he go and insists to see the room CCTV footage. Receptionist says we can’t show you. She says that man had eloped with my baby. Manager comes and asks Soumya to leave. He asks her to take Police’s help. He calls Security who throws Soumya out. Soumya asks them to understand. They take her out of hotel. Security says you can’t go inside. Soumya says he didn’t listen to me. Soumya calls Preeto and tells everything. She asks about Harman. Preeto tells that she lied to Harman about Soham and asks him to hide from Harman. Soumya says ok. Harman takes the call and asks about Soham. Soumya says they will get Soham, just Police verification is in process. Harman says once you both come, I will be fine. Preeto asks her to take care and come fast. Soumya ends the call. Later in the night, Soumya comes infront of Manager’s car and asks him to understand her helplessman and become God for her. Manager says I don’t want to become a God. Soumya says ok, I will call media and inform him that baby’s business happens in your hotel. Manager gets worried and shows her CCTV footage. Soumya sees Bhalla’s representative and asks who is he? Manager checks in the register and says he came from Singapore. He checked in and then checks out in 2 hours. Soumya tears the papers from the register in which Bhalla’s address is written and says Soham…I am coming. Soumya reaches Singapore and takes a cab to reach Bhalla’s house. A woman meets her and tells that she will help her. 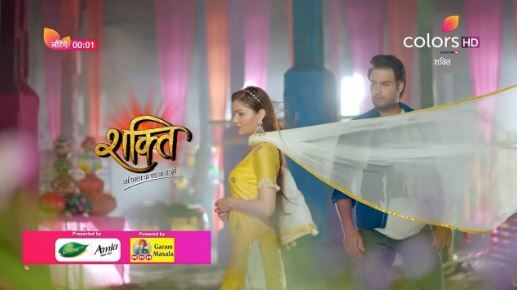 The post Shakti 20th February 2019 Written Episode Update: Varun sells baby Soham to Singapore couple appeared first on Telly Updates.